U.S. Gulf of Mexico (GOM) crude oil production is estimated to increase to record high levels in 2017, even as oil prices remain low. EIA projects GOM production will average 1.63 million barrels per day (b/d) in 2016 and 1.79 million b/d in 2017, reaching 1.91 million b/d in December 2017. GOM production is expected to account for 18% and 21% of total forecast U.S. crude oil production in 2016 and 2017, respectively. Production in the GOM is less sensitive than onshore production in the Lower 48 states to short-term price movements. However, decreasing profit margins and reduced expectations for a quick oil price recovery have prompted many GOM operators to pull back on future deepwater exploration spending, reduce their active rig fleet by scrapping and stacking older rigs, and restructure or delay drilling rig contracts. These changes added uncertainty to the timelines of many GOM projects, with those in the early stages of development at greatest risk of delay or cancellation. Contributing to the forecasted production growth are 14 projects: 8 that started in 2015, 4 starting in 2016, and 2 anticipated to start in 2017. 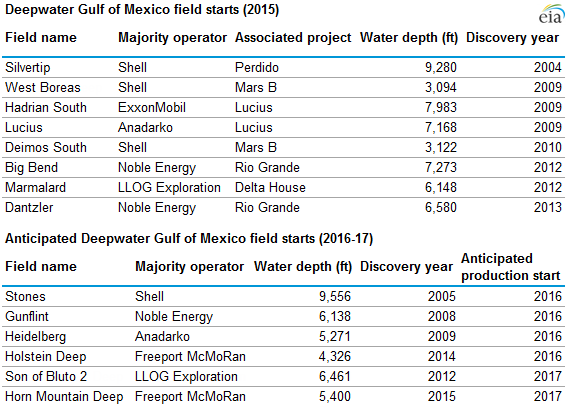 During 2015, eight fields in the Gulf of Mexico came online. With the exception of Anadarko's Lucius field, each of the fields was developed as a subsea well that is tied back to nearby existing production facilities. The use of subsea tiebacks allows producers to reduce both project costs and start-up times. The Lucius field produces oil using a type of floating production platform that supports drilling, production, and storage operations known as a truss spar. The Lucius spar is the largest in Anadarko's fleet. It consists of a large, hollow, weighted cylinder supporting a deck and is connected to an anchor on the seabed through a mooring system. Its design provides increased stability in harsh offshore conditions. Four fields are expected to start producing in 2016, including the Anadarko-operated Heidelberg field, which began producing in January. Heidelberg is producing at a spar that uses the same design as the Lucius truss spar, allowing the company to reduce development costs. Shell's Stones field development uses the first floating production, storage, and offload (FPSO) vessel in the GOM. FPSOs allow the development of fields that are complex, that have unique reservoir properties, and that do not have existing infrastructure. Crude oil produced from the Stones field will be transported from the Stones FPSO using tankers to refineries along the U.S. Gulf Coast. The other two fields expected to begin producing in 2016 (Gunflint and Holstein Deep) are subsea tiebacks. Two additional projects are projected to begin producing in 2017, and both are expected to be developed as subsea tiebacks.